Independently bottled Macallan has grown even thinner on the ground lately as the blending casks the distillery was willing to sell before the 2000s were bottled. 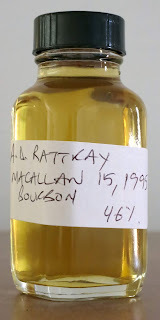 This particular cask was a double rarity - teenage Macallan from an ex-bourbon cask, very different from the sherry-driven style they're known for. This whisky was distilled on October 23rd 1995, filled into an ex-bourbon cask, then bottled on April 27th 2011 at 46% without coloring or chill filtration in an outturn of 334 bottles. Thanks to MAO for this sample. Nose: rich bourbon cask influence - caramel, vanilla, graham crackers, and mild oak - apple/pear/apricot notes, powdered lemonade, gently floral, some ethyl acetate, a little dusty/musty (but in a good way). After adding a few drops of water the vanilla and floral notes expand, the orchard fruit are joined by berries, the oak becomes honied, and the ethyl acetate is better integrated. Taste: sweet up front balanced by some alcohol heat, bourbon cask influence of caramel and mildly tannic oak around the middle, with a vague orchard fruitiness and citric tang throughout. After dilution the alcohol heat largely disappears, leaving big sweetness up front and less tannic oak in the middle, but the slide into the finish falls a little flat. While far more drinkable than the Whisky Galore Macallan, the clear ethyl acetate note throughout establishes a clear lineage. I think this one is rescued from disaster by more time and a more active cask, but the flaws keep it from being an unqualified winner. I can also see how this spirit works better when augmented with sherry casks. While it doesn't quite click for me, dilution helped in a way that makes me wonder if it would have been better off at 43% to begin with.